Posts tagged " ejuva in Singapore "
It’s my last week on the Ejuva Cleanse. A full week of juicing in Week 4 with no solid meals at all! 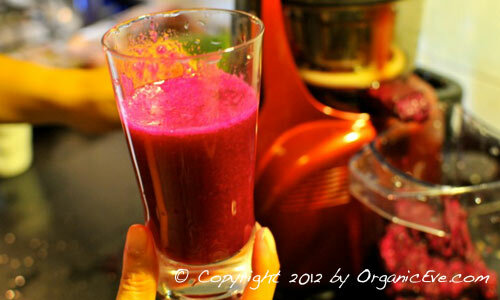 I’m shock by the stuff that came out from my body drinking just pure raw juices! Day 24 = Day 1 of phase 4! We started the day with 7 kg of organic apples, watermelon, papaya, pineapple and oranges and the Ejuva Cleanse kit sprawling on my kitchen top! Complete no cooking and no meals for week 4! It’s my first attempt on 100% liquid and raw diet. Ejuva Cleanse Kit on my Kitchen Stove. No cooking in week 4! I went to bathroom 6 times today. All were fluffy clouds, kind of like wasabi from a tube. The first one was a bit foamy with air bubbles (literally). Two big trips, 1 average and 3 small ones. No nose drip today. I felt that my stomach is churning all the time. What’s that? Is there a war within? The irritating nose drip started again at night and I once again felt a bit feverish in the evening. I received a text message that another fellow “cleanser” was feeling quite hungry. I asked her to juice more. I guess she might be eating high GI food and not juicing enough. I realized that my increased dosage of power and balance may not last me until the last day of the cleanse. I will have to decrease my dosage from 5 to 4 tablets for the next few days. Not to forgot that I need at least 5 tablets for post-cleanse day 1 and 2. Day 25 = Day 2 of phase 4! I walked about 2 miles and started the five tibetian rites again. As I read from the manual, exercise is very crutial during this phase. I went to the bathroom twice in the morning, giant ones! I saw small raisin kinds of bits, some literally looked like grape skin? Darker color output. Probably doing the five rites help! Adam commented that whenever he consumed Para Mia (part of the Ejuva Parasite Cleanse), his nose will start to drip, almost immediately. Coincidence? 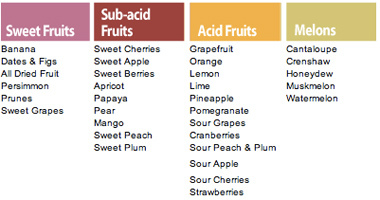 We read that we cannot mix acidic juice with sweet juice. I finally found a website that explains it clearly with easy to follow diagrams. Below is one excerpt of the diagrams. 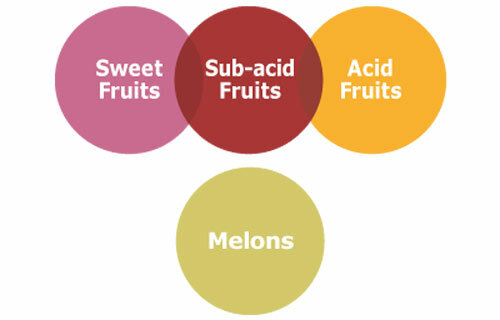 For the definitions and more useful diagrams, go to their website here (http://www.acidalkalinediet.com). So now I know I should never mix watermelon with any other fruits! I went to the bathroom the third time with dual-colored output and darkish semi-liquid “stuff”! It looks like I have a sea urchin in my toilet bowl! Gross! 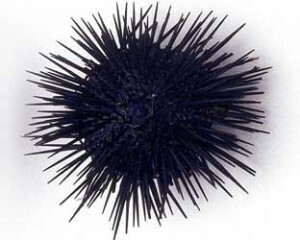 A Real Sea Urchin! Got the idea? The output at the forth trip was liquidy and a bit foamy with goji-berries-look-a-like stuff that also resembled papaya bits. Day 26 = Day 3 of phase 4! We walked a mile and did our five rites, getting the blood circulating! I went to the bathroom twice, not much output. I feel energenic in the morning but sleepy and feeling a bit weak in the afternoon. We tried the dragon fruit juice today. The color is a funky red but it taste so much better than beetroot! 🙂 It’s great that Dragon fruit is easily available in Singapore! I went to the bathroom for the 3rd time in the evening and the output is substantial! It looks like a mixture of papaya and dragon fruit juice coming through! Day 27 = Day 4 of phase 4! I went to the bathroom twice in the morning. More dragon fruit came through. It actually looks like raspery jam! The ‘funky color’ lives on! Am I not grinding my teeth as much? I also felt that my tongue is very dry when I wake up in the morning. Could it be attributed to less grinding too? Adam mentioned that he heard me grind my teeth a week ago but the grinding was much less severe and vigorious. We went to the Botanical Gardens with some friends in the morning. My nose was constantly dripping! I was so tired just after 2 hours in the park. Could it be the sun or dehydration? I was totally lethargic, and probably the worst I have felt since on I was on the cleanse! I realized that I’m into my second last day of the parasite cleanse. Maybe it’s the reaction to the parasites die-off? On the way back, I felt that I’m going to come down with a flu. I had several small sessions in the bathroom during the day. Had a humongous session at night around 730pm! Multi-colour with of shades raspberry and dark browns. I saw the alleged “worms” again, that look like muscus streaks or tendon looking things! (See “ascaris roundworms” in my week 3 review.) It felt that you are giving birth to …… You get what I mean. I took a 2 hour nap and felt much better. I don’t think anyone can do this cleanse, you have to be serious committed in wanting to do a cleanse and a system overhaul! Day 28 = Day 5 of phase 4! I felt pretty energetic in the morning, as if I have slept forever. Could it be the nap yesterday? I felt a bit tired around noon time. My nose is still dripping but not as much as before! I’m seeing less of both rice-looking thingy and “couscous” in the output. Am I done cleansing or not all the parasites have reacted to the cleanse? I felt much better than yesterday. I surfed the Internet for more picture of the cleanse “output”. My conclusion: I definitely have killed some parasites! Today is officially our last day of parasite cleanse. But from the “exodus” of parasites-looking carcasses, I think I will continue until the products run out, as advised in Ejuva manual. I drank some dragon fruit juice at 5:30pm and saw it coming out at 7:30pm. By 10pm, the last batch is out! 4.5 hours should be a good transit time for a cleaned system? Day 29= Day 6 of phase 4! I woke up in the middle of the night with rapid heartbeats. I think the rate is probably in the 90s. Very strange. I went to the bathroom 6 to 7 times today. I lost count. It’s not diarrhea but real stuff. I have not seen more undigested food or worm-carcass-looking things. I do still have some mucus bit and some foamy stuff coming out. These were mostly floaty output. It’s really amazing how much junk I have inside of me after 6 days of just fruit and vegetable juice! I had my last scoop of citrus enhance (part of the parasite cleanse), which lasted me exactly 15 days. I’m almost done with moflora. In fact, I’m almost running of all products (Power, Balance, Combi), except for Renew. Adam has more left over than me. He is also not going to the bathroom as much as me. Could it be because he consumed less tablets than me? Peter noticed that his face is somewhat brighter/fairer? Even his sun patch has faded significantly. We tried the carrot, cucumber and apple drinks as in the suggested recipe and they were yummy! Day 30 = Day 7 of phase 4! Final weigh-in: I lost about 3.5kg, that almost 8 pounds. Adam lost 6kg (13 pounds)! My stomach is visibly flatten and I also noticed that I have less cellulite at the back of my thighs. Our last day was not so eventful. I went to the bathroom about 4 times. The last one was a bit floaty and foamy. I felt a bit feverish again in the morning. I went for a whole body deep tissue massage. Cleanse Review: Are these toxins? The masseuse mentioned about water retention on my waist, thighs and calves. I had a hot mask on my back. Water started to seep out. That is weird, or it is just sweat? Anyway, she uses traditional Chinese massage method and my waist just look badly bruised. From her point of view, toxins were surging out from my skin! What we do for the name of detoxification! Get a Cleansing Buddy! It’s much easier to do the cleanse as a team. And you do not want to see your partner slurping off the spaghetti off the plater while you are enjoying the cup of fruit juice! If you are doing this cleanse alone, find a partner on Organic Eve! Juice, don’t blend. Make sure that you are drinking pure juice with as little pulp as possible. 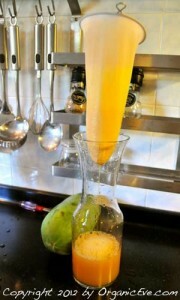 All the pulp of the fruits/vegetables are retained when you blend instead of juice. Remember that your body will always choose digestion over cleansing. Do not let your cleansing come to a halt by drinking too much pulp. In fact, I did a “double filter” after I juice just to minimize the pulp. 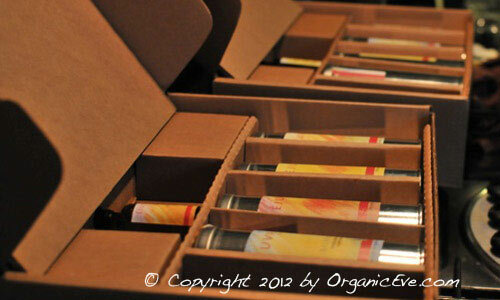 Ejuva Cleanse Review: We found our juice too pulpy and decided to filter off the pulp! Make sure you have juice in your hand to sip at all times! I cannot over emphasize this. One of the biggest mistakes to make on the cleanse is to not constantly sip on juices. Remember, you are cleansing not fasting! Once your body goes into the fasting mode, you will try to abort the cleanse at the first opportunity! I overate on the first day (the first day of solid food after 7 days). Even though I ate just pure raw salad for both lunch and dinner. I think I act too much. Felt really stuffy when I went to bed. I felt much better when I woke up. It is interesting how the output was dramatically reduced when I started on solid foods. I go to bathroom 2 times now (back to normal) instead of the 5 to 6 times during phase 4. It is indeed counter intuitive, but like what I read before in Arnold Ehret’s “Muscusless Diet Healing System”, the average person carries with him, 5 to 10 pounds of decayed feces. Ok, maybe I should do my next cleanse sooner ….. Both me and Adam gained 1 pound each and managed to keep off most of the weight loss. Of course, weight loss was not our main objective on the cleanse but it is a good by product! And we both kept our flatter stomachs! Our bruxism seemed to have stop completely! Oh my oh my, did we just prove that bruxism is toxic/parasite-driven and not emotional? 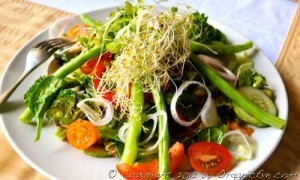 We increased our intake of raw food in the weeks following the cleanse. Your body seems to know what to crave and what’s good for you I guess! Ejuva Cleanse Review: Salad lunch post cleanse!